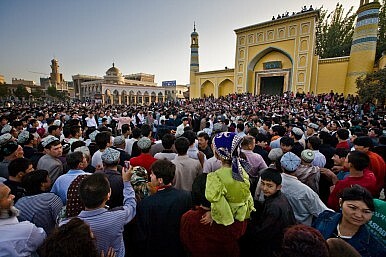 Uyghurs gather at a mosque in Kashgar. Inequality in education has been a much-scrutinized aspect of minority life in China. Minority populations are, on the whole, poorer and less educated than their Han compatriots, and many commentaries point out that educational inequality leads to unequal economic outcomes, relegating minority populations to “second-class” status even in their native regions. Yet even as the Chinese government invests enormous sums into shoring up education in minority regions, minority relations with the center continue to deteriorate. Expanding Chinese state education seems to be doing little to mitigate these yawning disparities. As a result, many minority populations reject state education for their children even when it is made more available to them. Field research in Tibet has shown that increased access to education did not translate into a substantial increase in school enrollment—many families preferred to send their children abroad to Nepal and India or to charity—or diaspora—funded community schools rather than send them to state schools. The same phenomenon has been observed in other minority groups, including the Uyghurs. By banning fasting on Ramadan, China once again reinforces the incompatibility of the most basic moorings of Uyghur identity with enfranchisement within the Chinese establishment. It reminds Uyghurs that a heavy toll must be paid to embark on the road to prosperity in China. No amount of material investment will draw China closer together if the Uyghurs and other minority populations are not convinced that they can stake their future success on integration with the Chinese nation. Andi Zhou is a Program Assistant for the China, East Asia and United States Program, working out of the EastWest Institute’s New York Center. As Global Democracy Retreats, Ethnic Cleansing Is on the RiseThe World Must Save the UyghursThe Muslim World Remains Largely Mute on Uyghurs’ PlightThe US and China Are Talking Again, But 'Competition' Is Set to ContinueNeighborhood Watch: Will Asian Countries Turn a Blind Eye to Uyghur Issues in China?